Linda with Sibusiso and Harmony, the StarLion Team gather for the days planting ceremony. In order to save these living legends in their natural endemic habitat, the Global White Lion Protection Trust has been securing the ancestral Heartlands of the White Lions for decades. 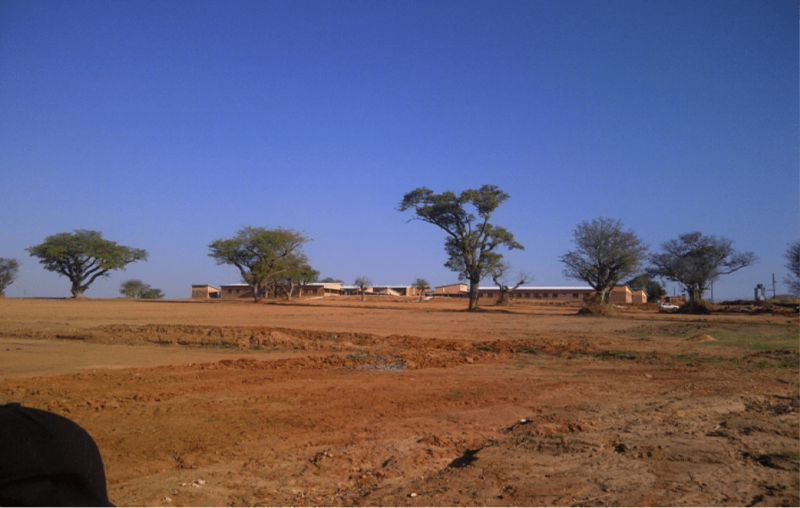 Consequently, it is no surprise to learn that our land in the South – Mbube – which houses the source of the Timbavati river, was once declared a sacred site by African kings for many centuries before the Kruger was declared a National Park. Our Non-Profit Organization does the conservation work for a global heritage, with limited resources but with huge heart and unstoppable determination – work that should rightfully be shouldered and funded by governments whose responsibility is to the sustainability of our wildlife heritage. Regarded as Africa’s most sacred animal, we know that in protecting the White Lions, we also have to protect their natural ecosystem. Hence our motto: Lions, Land, People. 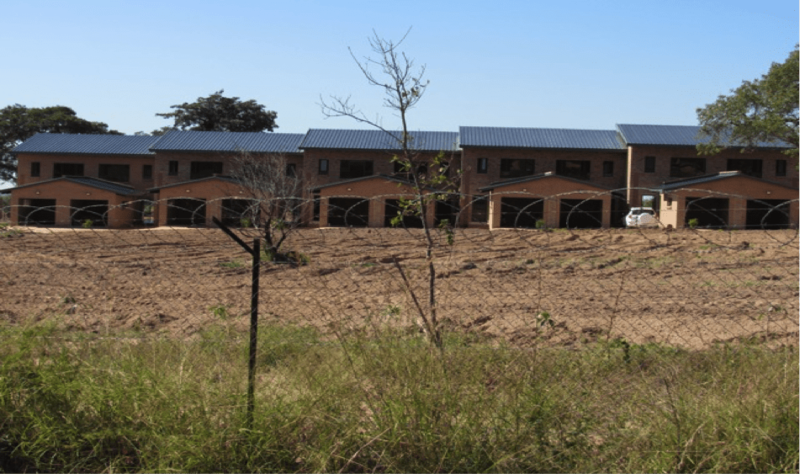 It is a travesty that high-level developers should come into this region without so much as an Environmental Impact Assessment, and ruthlessly bull-doze the ecologically sensitive head-waters of this Timbavati river system. As mentioned, these waters are regarded as a sacred river of the StarLions, with good reason: they form the life-blood to the whole body of the ecosystem, an artery all the way to and through the Kruger National Park delivering life-giving water to all the complex species who should be protected there. First opposing this illegal development, then employing enviro-lawyers to contest it, we now are working on solutions to redress the damage of a brutal scar on the landscape which can be seen from outer space. And, like a Phoenix rising from the dust and ashes, we have a plan to restore the site. Not only restoration but more: establishing a showcase restoration project that will not only prevent similar devastation from taking place in the region but create a lasting wildlands heritage site that serves future generations of learners and indigenous healers alike. Regeneration is the 6th Law of LionHearted Leadership™. And our efforts bring our StarLion youth program together with Eco Rangers from Acorn-to-Oaks school and partners, Conservation South Africa and Hans Hoheisen, including the blessing of the traditional authorities and the traditional healers, who will benefit for generations to come from the medicinal plants being planted today. It began with a planting ceremony that brought everyone together – including a visitor group of guests led by author Elen Thompkins who were enthusiastically roped in. After carefully consulting on the ecological importance of the different species, StarLion Eco Officer Sibusiso Ngobeni gathered indigenous saplings from all our StarLion centres together Cultural Officer Harmony Khosa, focusing on those which are used for medicinal purposes by our traditional healers in Maria Khosa’s lineage. But before we could take any step, we made sure we got permission from the great ancestor who guards over the StarLion River site: a giant Spirit Python who made an appearance in our dreams! You’ll see the rainbow ribbons in Her honour. Collaboration is the 7th Law of LionHearted Leadership™, and we at the Global White Lion Protection Trust excel at it! Even the cattle walking through assisting by contributing their dung as fertilizer to the young saplings! From Wetland to Wasteland: Where once was a rich biodiversity hotspot enjoyed by a vast variety of species, the protective layer of top-soil, 2-meters deep, has been removed from century-old trees, leaving the devasted site exposed massive erosion and landslide. On this scarred landscape, the foundations of Acorn-to-Oaks High School have been built. The illegal development: mushroomed-up without due process, Environmental Impact Assessments or a public participation process. Scar from outer space: Google Earth reveals the scar (bottom middle). 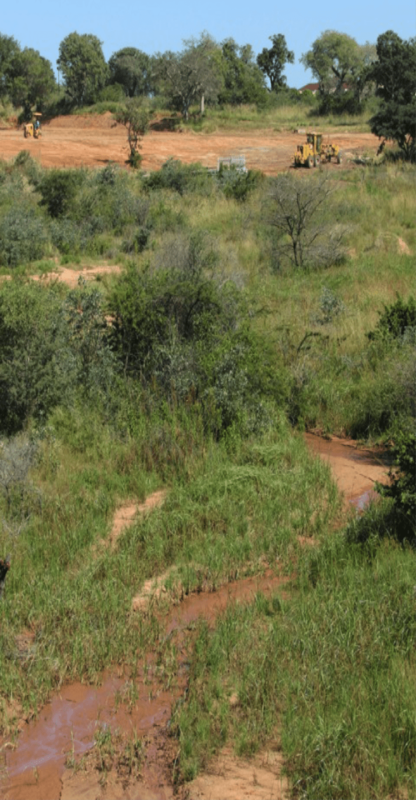 This ecologically-sensitive landscape at the Head Waters of the Timbavati River seeps from the foothills of the Drakensberg Mountains into the lands of Mbube (meaning “LionStar”) – then these wetlands flow all the way to and through the Kruger National Park, providing critical water to an endless variety of species. 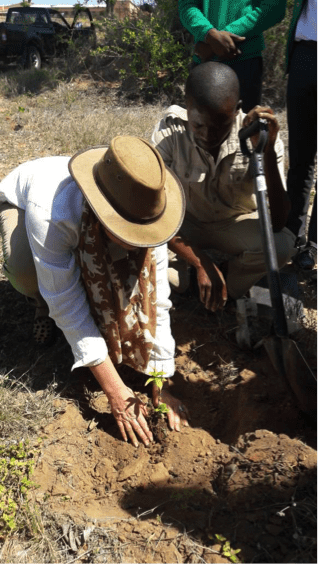 One of the 100 medicinal trees planted on a devastation site – and it’s only the beginning of a show-case restoration project that will leave a lasting heritage for future generations. sensitive wetlands that feed the Head Waters of the Sacred Timbavati River.